Nitzer Ebb confirming north america dates. The Industrial Complex Tour is starting with two shows in mexico and carrying on with many shows in the US and Canada as well. 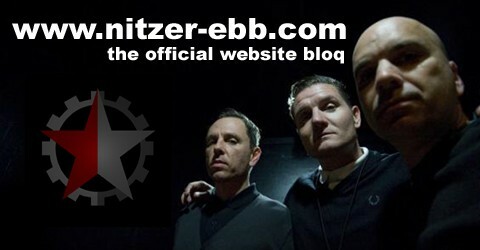 Visit http://www.nitzer-ebb.com for full tour update. An unreleased song from Nitzer Ebb is among the tracks that will appear on the Saw VI soundtrack when it’s released October 20 through Trustkill. Never Known is one of six unreleased tracks on the soundtrack, which includes material from Hatebreed, Lacuna Coil, Mushroomhead, Chimaira, Danko Jones, Shadows Fall, Converge, Kittie and others. Saw VI opens in theatres on October 23. Nitzer Ebb confirming two new show dates in mexico for november 2009. The band will be on stage in Monterrey on November 6th and the next day, on november 7th in Distrito Federal. Today Douglas is celebrating his 42nd Birthday! The Nitzer Ebb Network wishes all the best and much health, connected with the desire to be able to celebrate the release of new nitzer ebb album asap too. Leave your good wishes to douglas on nitzer ebb facebook site!